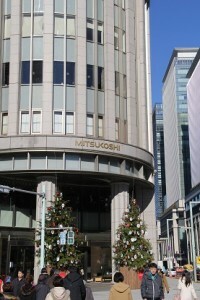 The flagship branch of the Mitsukoshi department store chain is the granddaddy of all such Japanese stores. 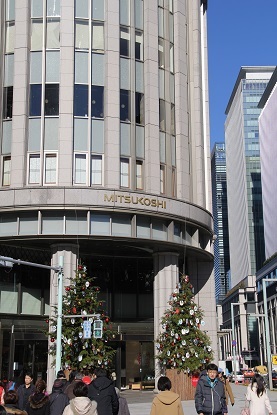 Mitsukoshi can trace its roots to 1673, and this branch became the nation’s first Western-style department store in 1914, featuring Japan’s first escalators,elevators,sprinklers,and central heating. The building was renovated and expanded in 1935,but the Trafalger Square-style lion statues out front are from the original structure. Look for the ammonite fossils in the marble walls. Check out the 1930 pipe organ in the central hall.Peek in the art nouveau theater on the sixth floor, added in 1927. Ride the elevator with the elevator girls in their white gloves and prim uniforms. Oh,and you can shop as well. From the free samples of Japanese delicacies in the basement to the English-style garden shop on the roof,Mitsukoshi is delight.